Told in rhyming couplets, Octopus Escapes is a story that keeps up with Octopus and a security guard who is outsmarted at every turn. A sure bet for read-aloud fun, this entertaining maraud through the amphibious exhibits also includes fun facts about cephalopods. 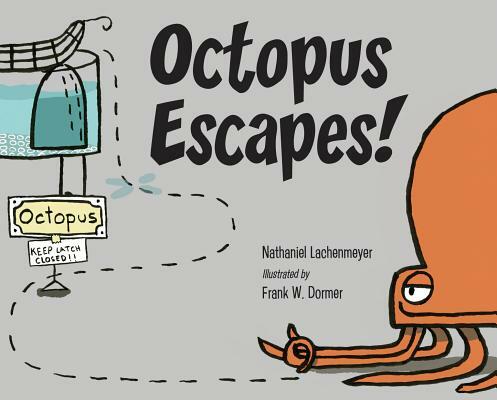 This fun fanciful story is shored up with real information about octopuses and depicts how they move and sneak. With a blend of kid-appeal and fun facts, this engaging story creatively uses sound words, easily enticing repeat readings. Nathaniel Lachenmeyer is an award-winning author of books for children and adults. Nathaniel’s children’s books include Broken Beaks, The Origami Master, and the forthcoming all-ages graphic novel, The Singing Rock and Other Brand-New Fairy Tales. Nathaniel lives outside Atlanta with his wife and two wonderful children. Frank W. Dormer is the author-illustrator of The Firefighter Duckies, The Sword in the Stove, Click!, Socksquatch, and The Obstinate Pen, as well as the illustrator of many other books for children, including the Aggie and Ben series of easy readers, and the middle grade series the Adventures of Jo Schmo. After the aquarium closes for the night, an adventurous octopus pushes out of its tank to visit neighbors, leaving the guard to clean up its mess. This engaging, anthropomorphic fantasy includes a short afterword referring not only to the relatively recent octopus escape from the National Aquarium of New Zealand, but to one in England in the 1870s and adding interesting facts about these aquarium stars. While on the lam, the titular Octopus (no gender) playfully threatens crabs and fish, splashes with penguins, steals the otters' ball to bowl at the approaching guard, is almost caught by a shark, inks, hides, and hurries back to safe shelter in its tank before morning. The simple text (two or three words on a page) relies on cleverly chosen vocabulary, onomatopoeia, and rhyming active verbs—"Octopus peeks. / Octopus streaks. // Octopus smoosh! / Octopus whoosh! "—with other sound effects incorporated into the pictures. Dormer's engaging illustrations, done in ink with digital color, employ a simple black line. Human skin tones vary; the guard has a greenish yellow face. The octopus's eyes are correctly placed in its midsection along with an (imagined) expressive smile. Other sea creatures include a sea turtle parent and child who find the octopus antics as amusing as young readers and listeners will. Lighthearted entertainment just right for storytime.